INCREASED WIRING SPACE FOR THE EASE OF INSALLATION. DIMENSIONS IN COMPLIANCE WITH THE NEW EUROPEAN STANDARDS. EQUIPPED WITH DIN 46277/3 IRON SELECTION FOR THE EQUIPMENT OF CLIP FASTENING. 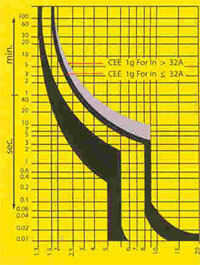 POSSIBLE INSALLATION ON THIN THICNESS WALLS. RUST PROTECTIVE, ELECTROSTATIC POWER COATING. EARTH AND NEUTRAL BARS FITTED AS STANDARDS. BUS BARS ARE PROTECTED BY INSULATED SHIELDS. MAINTENANCE FREE, WIPE CLEAN MOULDED COVER. RANGE: 4, 6, 9, &12 MODELS ACCETING 1,2,3 POLES HK CIRCUIT BREAKERS WITH OR WITHOUT EARTH LEAKAGE CIRCUIT BREAKERS TO SATISFY CUSTOMER NEEDS. SINGLE PHASE 1.5 MM THICK COMB TYPE BUS BAR TO ENSURE MAXIMUM SAFETY. THREE PHASE MAIN BUS BAR 4MM* 20MM IN THICKNESS AND WIDTH TO ENSURE GREATER FLOW OF THE CURRENT UP TO 100A WITHOUT HEAT DISSIPATION. FINAL POWER AND LIGHTING CIRCIT DISTRIBUTION. 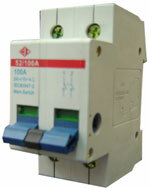 THREE POLE MCB, SIMILARLY, TWO POLE MCB IS INTERCHANGEABLE WITH TWO SINGLE POLE MCBs. AEI ENCLOSURES HAVE BEEN DESIGNED TO MEET THE FITTING REQUIREMENTS THOROUGHLY AND PARTIALLY WITH SPECIAL REGARD TO THE DESIGN THAT MAKE MAKES OUR ENCLOSURES TO MATCH ANY FURNISHINGS AGREEBLY. - THET ARE MADE OF 1.0 MM SHEET STEEL AND DESIGNED TO MAXIMUM CABLING AND HANDLING SPACE. - AEI METAI MAXIMIZE BOXES ARE AVAILABLE IN FLUSH OR SURFACE MOUNTING OPTIONS WITH KNOCKOUTS AT TOP AND BOTTOM. - FULLY RATED COPPER MAIN, NEUTRAL EARTH BUS BARS ARE PROVIDED. THREE PHASE & NEUTRAL DISTRIBUTION BOARD.COMPRISE A SHEET STEEL BOX ( COMPLETE WITH KNOCKOUT) FITTED WITH LINKED EARTHING TERMINAL BUS BARS. THREE PHASE & PLATES-FOR SURFACE MOUNTING FRONT PLATES ARE AVAILABLE & SUPPLIED WITH SURFACE AND FLUSH MOUNTING COMPLETE WITH COVERS. LARGE INDIVIDUAL NEUTRAL LUNGS FOR RAPID WIRING. STANDARDIZED KNOCKOUT TOP AND BOTTOM. FAST MOUNTING OF ALL COVERS WITH QUICK FASTER SCREWS. SILK-CREEN DIRECTORY OPPISITE EACH BREAKER PROVIDES MEANS OF QUICK IDENTIFICATION. INTERIOR REVERSIBLE WHEN BOTTOM WRIRING IS NEEDED. 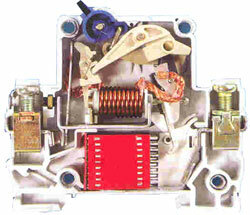 THE METAL BACK PLATE ASSEMBLY IS FOR USE CUSTOMERS TO MOUNT HK CIRCUIT BREAKERS. 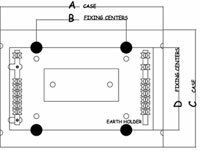 ENCLOSURES ARE DESIGNED SUCH AS AS TO ALLOW THE SEPARATE INSTALLATION OF THE STEEL SHET HUSING BY CUSTOMERS WISHING TO DIVIDE THE DISTRIBUTION BOARD INTO SEPARATE PIECES FOR EASY MOUNTING AND SAFETY. 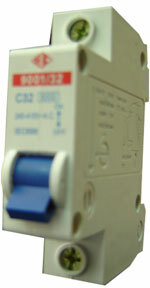 THREE POLES MCB IS INTERCHANGEABLE WITH THREE SINGLE POLE MCB. 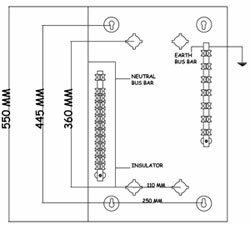 SIMILARLY TWO POLE MCB IS INTERCHANGEABLE WITH TWO SINGLE POLE MCBs. 4 MM* 20MM COPPER BUS BARS. THE OPERATION CHARACTERISTICS OF HK CIRCUIT BEAKERS ARE IN COMPLIANCE WITH CHARACTERISTIC OF STANDARD CEI 23-3 AND CEE 19. 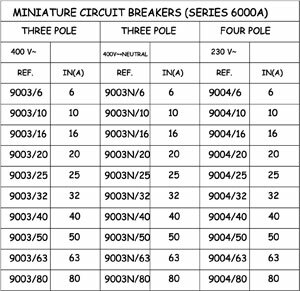 THE DIAGRAM BELOWS SHOWS HOW THE OPERATING RANGE OF HK CIRCUIT BREAKERS IS DEFINITELY WITHIN THE VALUES PRESCRIBED BY THE SPECIFICATIONS. THE OPERATING CHARACTERISTICS ARE CONSIDERED AT THE ROOM TEMPRETURE OF 20 5 C.
IN CASE OF HIGHER TEPRETURES, THE TEMPRETURES RELAY OF ALL THE CIRCUIT BREAKERS DECREASE THE CURRENT PROGRESSIVELY WITH INCREASE IN TEMPRETURE ACCORDING TO STANDARDS, WITH A 40 C TEMPRETURE, WHICH IS APPROXIMATELY THE TEMPRETURE THAT CAN BE ATTAINED IN FULLY WIRED, A 20 % APPROXIMATE DECREASE IN THE RATE CURRENT VALUE IS ALLOWED. CIRCUIT BEAKERS ARE EQUIPPED WITH A TRIP DEVICE ENABLING THE CURCUIT BEAKKERS TO OPEN THE CONTACTS IN CASE OF OVERLOADS OR SHORT-CIRCUIT EVEN WHEN THE LEVER IS IN CLOSE POSITION. 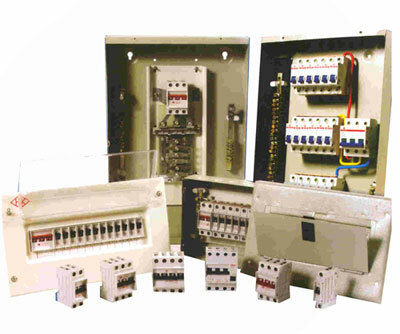 ALL THE POLES OF MULTI POLAR CIRCUIT BREAKERS ARE INTERCONNECTED BY MEAN OF A DEVICE THAT OPENS THEM SIMULTANEOUSLY. BOTH CONFIGURATION AND LAYOUT OF ALL THE COMPENENTS THAT PROVIDE THE AUTOMATIC OPENING O THE CONTACTS IS SUCH AS TO MAKE THE OPERATION VERY FAST WITHOUT DAMAGING THE OTHER COMPONENTS. 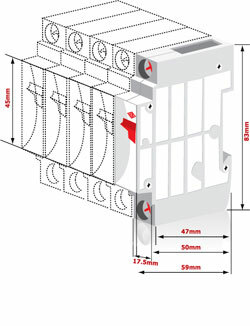 THE CIRCUIT BREAKER FRAME IS MADE OF HIGH HEAT RESISTANCE SELF-EXTINGUISHING INSULATED MATERILA. AUTOMATIC CIRCUIT BREAKERS ARE SUBDIVIDED INTO TWO SUB-CATEGORIES ACCORDING TO THEIR BREAKING CAPACITY WITH DIFFERENT IN CONSTRUCTION AND USE. 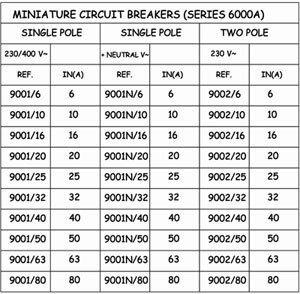 SERIES 9000 WITH 6000A BREAKING CAPACITY:INCLUDING THE MULTI POLE CIRCUIT BREAKERS FROM 5 TO 80A. PARTICULARLY SUITABLE FOR USE IN INSTALLATION WITH THEIR OWN TRANSFORMER ROOM WHERE THE SHORT -CIRCUIT IS EXPECTED TO ATTAIN HIGH VALUES, OWING TO THE PROXIMITY OF THE MV/LIVE TRANSFORMER.HIGHER BREAKING CAPACITIES COULD BE PROVIDED. 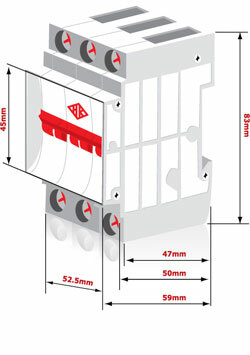 HK CIRCUIT BREAKERS ARE EQUIPPED WITH A DEVICE TO REALSE CLAMPING ON DIN 46277/3 SECTION AND THUS CAN BE FITTED TO MOST ENCLOSURES, SWITCH BOARDS AND CUBICLES AVAILABLE ON THE MARKET. IN PARTICULAR, SPECIAL CARE MUST BE GIVEN IN COMPLYING WITH THE INSULATING DISTANCE AND AVOIDING THE LIVE COMPONENTS TO BE ACCESSIBLE. AEI HAVE DEVELOPED A FLUSH ENCLOSURE WHICH ENSURE PROPER FITTING OF THE HK CIRCUIT BREAKERS AS WILL AS PERFECT AESTHETICAL COORDINATION. 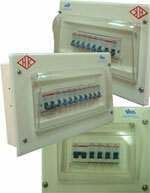 THIS ENCLOSURE COMES COMPLTET WITH ONE OR THREE PHASE, EARTH AND NEUTRAL BUS BARS. 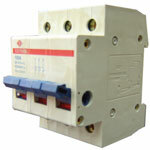 HK CIRCUIT BREAKERS ARE EQUIPPED WITH WIRING HARNESS EASY AND RAPID WITHOUT REQUITING ANY PRELIMINARY DRESSING.